With the election season lurching into its eighteenth month, voting is starting to feel like winning a free meal at Golden Corral: in theory you are grateful for the opportunity, but you are not sure if you really won anything, and a life of famished solitude is beginning to sound like the most preferable fate. However, I would like to push your thoughts on who you should vote for aside and, instead, discuss voting itself, specifically voting ID laws. Since the Voting Rights Act of 1965, the Department of Justice must sanction all voter ID laws to ensure that states do not revert back to Jim Crow era practices of voter suppression. In Shelby County V. Holder, the Supreme Court overruled this policy by a 5-4 decision, when Chief Justice Roberts declared it a federal overreach no longer necessary in a post-Jim Crow world. 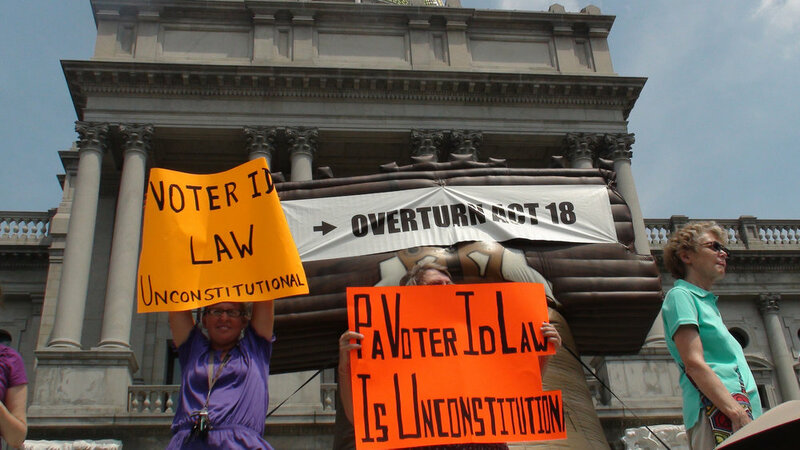 Since then, seventeen states passed voter ID laws that require voters to present a valid photo ID. Defenders of these laws argue that People who impersonate other voters in order to vote multiple times cancel out thousands of Americans’ votes. Showing ID before voting seems like a solution to this problem. That's why 80% of Americans favor such laws. However, there does not seem to be much of a voter fraud problem. Since 2000, only ten cases of voter impersonation have been recorded, or the kind of voter fraud these laws would prevent. Including fraud via absentee ballots, the number rises to 491, over the course of twelve years and hundreds of millions of ballots cast. In short, you are more likely to be struck by lightning on your way to vote then you are to be the victim of voter fraud. Defenders of the law reply that even if there isn’t widespread voter fraud, these laws can still do some good if they stop one case. After all, we keep all sorts of inconvenient things around that don’t do us much good, like pet birds and Regis Philbin. Except that voter ID laws end up doing far more harm to democracy than they do to help it. Millions of Americans lack the kind of photo IDs required by these laws, and either lack the means to reach the agencies that issue these IDs, or lack the means at all to even pay for an ID. The Result is an indirect “poll tax” that, if passed nationally, would keep 21 million Americans, predominately ethnic minority groups, from being able to vote. One of the most recent examples of a state passing voter ID laws is North Carolina, a state whose primary exports are cigarettes, Krispy Kreme, and now, innovative racism. When writing the law, Republican lawmakers commissioned research to discover which voting restrictions have disproportionate effects on African-American voters. However, rather than avoid provisions that reduced minority turnout, they put all those provisions in the bill. That is like a school cafeteria asking if any child has a nut allergy, and then putting nuts only in the dishes of the children who raised their hands. IDs more likely to be used by African-Americans like government-assistance IDs were declared invalid, a week of early voting (including a day where black churches host “souls to the polls” events across the state) was taken off the calendar, and day of registration to vote, a resource used disproportionately by black voters, was prohibited. The Fourth Circuit of Appeals struck down the law, saying “the new provisions target African-Americans with almost surgical precision,” and the Supreme Court sustained the decision, but only by a 4-4 deadlock. Republican lawmakers were quick to defend their actions, claiming that the law was not motivated out of racism, but out of partisanship: black voters typically vote Democrat, and in the words of Pennsylvania Majority Leader Mike Turzai, voter ID laws would help Republicans win the Presidency. Whether the motivation is racial or partisan, the result is a deliberate attempt to bar American citizens from partaking in democracy. I understand that many Americans have nonpartisan and nonracial reason for supporting voter ID laws. However, there surely must be a better way to solve a problem that has affected ten voters over twelve years than by barring potentially twenty million votes from being cast every year. That is like those who try to eat healthy by getting frozen yogurt, only to cover it in fudge and Oreos. It is disheartening to think: with the 50th anniversary of the Voting Rights Act approaching, Justice Roberts declared protections of voting rights unnecessary in a post-Jim Crow world, only for states to prove him wrong by passing laws that would bring back a more marketable version of Jim Crow voter suppression. The voters who would lose access to their voting rights -- these elections affect their lives; they affect their child’s classroom size, their own health care coverage, whether their teenager can go to college, and whether their grandparent can afford hip surgery. They should not lose that right just because their community tends to vote Democrat. If Republicans can only win by suppressing turnout, perhaps they should consider a platform that doesn’t require silencing voters to pass. This is why this election matters. The next President will be appointing a Ninth Supreme Court Justice, who will be the tie breaking vote on the appeal to reinstate the restrictive North Carolina ID law, along with similar laws in a dozen other states. Millions of Americans’ chance to participate in democracy, an opportunity many people I know plan to forsake this November, hangs in the balance. Self-government is not a privilege; for Americans, it is a birthright. We may all have to eat at Golden Corral this November but, at the very least, we should all have a say in what regrettable dish we order.